With the help of his graduate assistant Jessica Yorzinski, neuroscientist Michael Platt of Duke University set out to show what it is about the peacock's tailfeathers that attract potential mates. Unlike behavioral ecologist Marion Petrie of Newcastle University, who cut off the stunning eyespots from several of the males in her 1990s experiment, they chose a less invasive method. 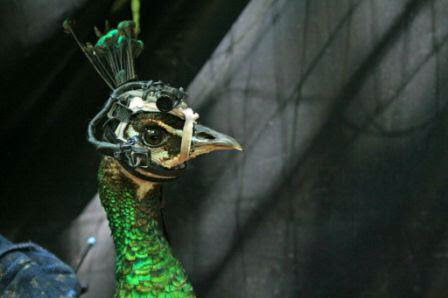 They outfitted the head of a peahen with special eye-tracking equipment (IMAGE ABOVE) that weighs just 25 g and consists of 2 cameras attached to a helmet that loops over the bird's beak. One camera is trained on the pupil of an eye and tracks its position and the other captures the scene in front of the bird. To wirelessly collect the data, they strapped a battery-powered transmitter to the bird's body. After analyzing dozens of hours of video from 16 different peahens, the researchers found that the female birds virtually ignored the top part of the train, the head, and the crest, instead going side to side at the base of the tail and checking out the peacock's legs (VIDEO HERE). "It's pretty suggestive that whatever the females are interested in, it doesn't seem to be the eyespot themselves....They might serve the function of helping to call the female over, but once she gets there they don't really seem to matter anymore," says Platt. As it turns out, size does matter.